As you can probably tell from a previous post I recently spent a day in Bradford catching up my good friend Natalie Atkinson, a doctoral candidate in the Department of Archaeological Sciences at the University of Bradford. Natalie is currently researching microwear on lithics, investigating new ways in which to quantify and record data as a part of the Fragmented Heritage project (more on that below). Whilst I was there I managed to take a few brief photographs of the lithic lab with my trusted Pentax s1a camera loaded with black and white 35mm film, which will be the focus of this entry with Natalie kindly modelling. Although this post won’t be focused on bioarchaeology, it is pertinent to briefly mention it here as Bradford has, and continues, to play a vital role in the research and teaching of bioarchaelogy in the UK. Initially there was a course that ran every 2 years at UCL during the 1980s that covered the study of archaeological human remains, taught by Don Brothwell, and a course at the University of Sheffield, run by Dr Judson Chesterman (the former is now the MSc in Skeletal and Dental Bioarchaeology run by Professors Simon Hillson and Tony Waldron). In 1990 the universities of Bradford and Sheffield started to run a joint course (MSc Osteology, Palaeopathology and Funerary Archaeology). This was initiated and taught by Professor Keith Manchester, alongside Professor Charlotte Roberts, the latter now at Durham University and running an MSc in Palaeopathology. The course ran from 1990-1999, with Bradford now running the MSc in Osteology and Palaeopathology, and Sheffield running a course in Osteology and Funerary Archaeology. The joint course has formed the basis for the development of many UK university masters courses on archaeological human remains. I should perhaps also admit to a twinge of osteology envy here as the technical facilities and osteological reference collections at Bradford is perhaps one of the best in the UK, ranging, as they do, from the ability to analyse stable light isotopes on-site in a dedicated lab, 3D scan using a FARO laser, stock an extensive traditional and digital radiography equipment and x-ray library, and have the facilities for the carrying out of microscopy research, histological sampling and analysis. Alongside this the department also hosts a human skeletal reference collection spanning from the 19th century to the Neolithic period. (For further information on the history of bioarchaeology in the UK see Roberts 2006 & Roberts 2012 below). But I digress! This post is not about bones, it is about stones, about the physical artefacts produced and crafted by Homo sapiens and our ancestral hominins over hundreds of thousands of years, indeed millions of years. It is also about a department of archaeology that specialises in the scientific study of the archaeological record. Indeed it was this department that first introduced me to the joys of archaeology as a post-college but pre-university archaeology student-to-be. It was here on the many itinerant trips to visit friends from home that I became aware of the great breadth and depth of the archaeological world. 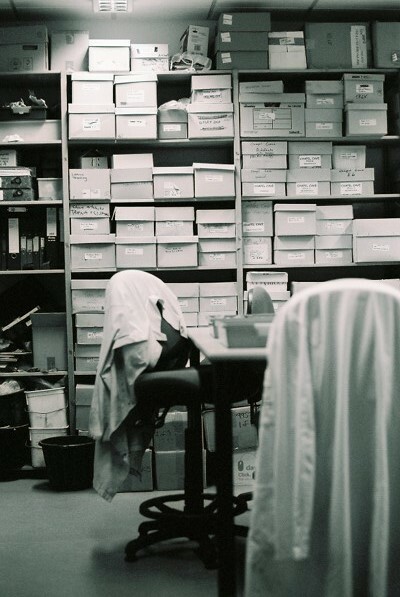 Returning to it again reminded me of the sheer size of the department and of the many specialisms, and specialists, within archaeological science that the department is home to. But this is a brief introduction of the lithics laboratory at the university rather than the department or of lithics themselves (although see some of the core texts such as Andrefsky 2005 & Keeley 1980 for detailed introductions to studying lithics). It is pertinent to point out here that physical objects can also be considered to have lifespans, where, with the increased age of an object, comes the increased possibility of a extrinsic mishap and intrinsic fragility, i.e. accidents and/or breakages due to the deteriotation of the material used to construct the object. As Crews (2003) mentions in his book on human senescence objects do not age biologically as plants or animals do, but they do age with use and wear. This is highlighted when Crews (2003: 34) discusses this in reference to the lifespan of glass test tubes as researched in Medawar’s 1946 wear-and-tear theory, where it is possible to understand likely lifespans of objects based on observation and material studies. This is an important point as artefacts in the archaeological record likely had a finite life, much as objects do today, such as T.V’s which can become quickly out of date or obsolete as digital technology changes and improves. Lithics, or stone chipped tools, are often produced using flint or chert material and are knapped from source material (such as naturally occuring flint nodules or mines) to produce a wide variety of tools. Perhaps some of the most immediate visual tools that are recognisible include the mighty handaxes seen in the Upper and Lower Paloaelithic periods down to the specialised microlithics of the Mesolithic and beyond. These can of course have a range of different applications depending on the context of their use. Lithics can also be retouched and reused as necessary, can be the product of mass produce or can be singular one-off productions (Andrefsky Jr 2005). Use-wear analysis is a major academic and commercial focus today in understanding the role that lithics have played over their lifespans, from original use to final deposition within the archaeological record. As such this mini photo essay presents the lithic lab at Bradford, home to this literal cutting edge technology. Remains of the day. Archaeologists can largely be found at one of three places: excavating in the field, typing in front of a computer or analysing in the laboratory. This is the lithics laboratory at the Department of Archaeological Science at the University of Bradford. It is a place where time spans hundreds of thousands of years as Neolithic flints mix with Palaeolithic handaxes, where the debitage of modern reconstructions lay in buckets beneath the technical knapping manuals. Lithic analysis involves being able to recognise, re-piece and understand the production of lithic flakes from flint or chert nodules. The material produced can be as varied as projectile points, scrapers, burins or handaxes, depending on the aim of the original knapper. Lithics, as in the above photograph, are often stored securely and safely in archives accessible to specialists , museums and researchers, sometimes heading out for public display. Lithics survive particularly well in the archaeological and palaeontological record due to the robust material and natural composition. Analysing the physical artefacts of the past. Natalie takes a look at the fracture patterns and use wear on one of the many lithics that the lab at Bradford holds in its store. It is important that, as well as the original lithics spanning many different period sites, that the researchers can carry out experimental work by knapping their own flint examples to replicate the methods that our ancestors used. 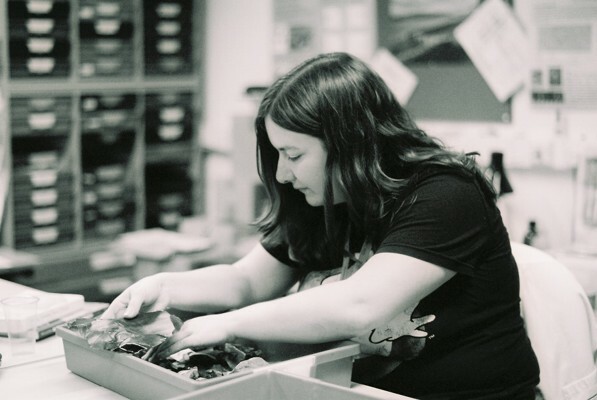 As a researcher on the Fragmented Heritage project Natalie will be investigating the tool use, production and object manipulation using imaging and analysing techniques. This will involve the use of the latest technology such as Scanning Electron Microscopy (SEM), laser scanning, CT scanning and 3D microscopy to help quantify use-wear analysis amongst other aims. The doctoral project is partly experimental, but will also possibly use existing lithic assemblages from Spain, England, Kenya and Jordan from the Palaeolithic periods to investigate new methodologies in identifying and quantifying use wear. Projecting the past. Natalie’s part in the Fragmented Heritage project is just one facet in this international research project. A second doctoral position will be looking at the post-depositional movement of archaeological remains, helping to implement new and existing methodologies in understanding the lithic microwear involved in identifying post-depositional signatures. The Fragmented Heritage project is looking to improve the recording the scale and nature of fragmented remains in archaeological contexts, involving the use of new landscape survey technology to help highlight new hominid sites. The partners of the project also include the Home Office (for forensic applications), Citizen Science Alliance , the National Physical Laboratory (measurement and materials science laboratory), Science Museum Group, and Historic Scotland. The core project staff, from the University of Bradford, are Dr Randolph Donahue (lithic microwear), Dr Adrian Evans (quantification in lithic functional studies), and Dr Andrew Wilson (digitisation technology). An important part of any scientific research is the ability to document, describe and understand the implications of your research. However you also have to be able to defend your research and accept or challenge new interpretations as necessary. Archaeology may be stuck in the past but revolutions, both in the methods and use of new technology, and in the actual archaeological, or palaeoanthropological, records are coming thick and fast. Researchers will come and go, but the artefacts and contextual information will, if stored correctly and safely, always be available to analyse and interpret using innovative methods to maximize the information that archaeological sites artefacts hold. This has been a brief foray into the world of lithic research at the University of Bradford but it has been eye-opening journey for me. As an osteoarchaeologist I admit that I can sometimes become too biased towards the skeletal remains found in the archaeologically record, that I wonder what that person saw, felt and did in their lifetimes, that I can forget we have such a vast catalogue of physical artefacts stored at universities, institutions, museums and units across the world. It is these artefacts that document the technology of previous populations – of how the individuals and populations adapted, responded and lived in their environments during their lifetime. The study of these artefacts clearly benefit from new technological approaches, but they also benefit from holistic approaches and multidisciplinary influenced projects. 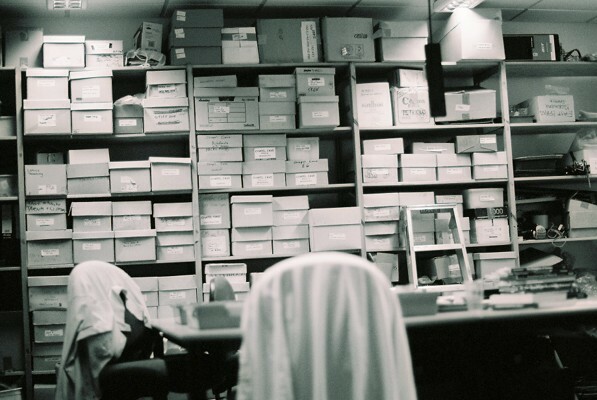 Perhaps most of all they benefit from researchers coming and going, sitting silently in their storage boxes waiting for their chance to tell their story of their lives, both during active use and deposition into the archaeological record. Thanks to Dr Adrian Evans for the permission to post the photographs here that are of the Lithic Lab at the Department of Archaeological Sciences at the University of Bradford. Thanks also to Professor Charlotte Roberts for clarification on the history of bioarchaelogy in the UK. Further information on the Department for Archaeological Sciences, a part of the Faculty of Life Sciences, at the University of Bradford can be found here. More detailed information on the two main core research strands (social and biological identities and archaeological sciences) can be found here. Head over to lithic specialist Spencer Carter’s Blog at Microburin to learn about the identification and use of microlithics in the Mesolithic period (particularly in northern England). 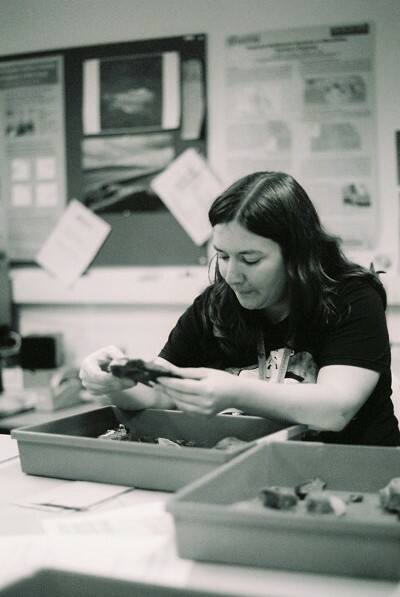 Spencer has dedicated a few entries on the blog discussing his amalgamated methodology for processing lithics from archaeological sites and his set up for the photography of lithics to archaeological publication standard, which are very handy. Check out Hazelnut Relations, a blog ran by archaeological researcher Marcel Cornelissen, to learn about studying lithics and use-wear analysis in a laboratory setting, and also to read about the author’s research into the European Mesolithic-Neolithic transition. Marcel is also particularly keen on fieldwork so the blog entries are particularly interesting as they combine the joy of the field and the lab together. Andrefsky Jr, W. 2005. Lithics: Macroscopic Approaches to Analysis. 2nd ed. Cambridge: Cambridge University Press. Crews, D. E. 2003. Human Senescence: Evolutionary and Biocultural Perspectives. Cambridge: Cambridge University Press. Keeley, L. H. 1980. Experimental Determination of Stone Tool Uses: A Microwear Analysis. Chicago: University of Chicago Press. Roberts, C.A. 2006. A View from Afar: Bioarchaeology in Britain. In: Buikstra, J. & Beck, L. A. (eds) Bioarchaeology: Contextual Analysis of Human Remains. London: Elsevier. pp. 417-439. (Open Access). Roberts, C. 2012. History of the Development of Palaeopathology in the United Kingdom (UK). In: Buikstra, J. & Roberts, C. (eds.) The Global History of Palaeopathology: Pioneers and Prospects. Oxford: Oxford University Press. pp. 568-579. (Open Access). I’ve recently updated this blog with a side page, the Human Skeleton tab, for the skeletal series posts. It can be found just next to the ‘About’ section. Here you can handily find all the posts that I have wrote so far about the bones in the human body as used in the study of human osteology in archaeological contexts. The posts discuss the human body in easily recognisable sections (such as leg, arm etc), and the contents include information on how to recognise and name various elements, anatomical landmarks and what to expect if you have the pleasure of digging them out! Hopefully the series will give you enough information on how to differentiate and recognise the various type of bones in the human skeletal system, and also provide information on how individual bones fit together as whole in the skeletal system. I recently had the great pleasure of excavating a medieval site in the lovely Peak District village of Castleton with the University of Sheffield. Obstinately, the yearly project aims to find the medieval leper hospital in, or just outside the village, but there has been little luck this season of digging which was recently completed. Whilst I only partook in a few days worth of excavating, it was with great pleasure I found myself in the great (wet) outdoors once again. 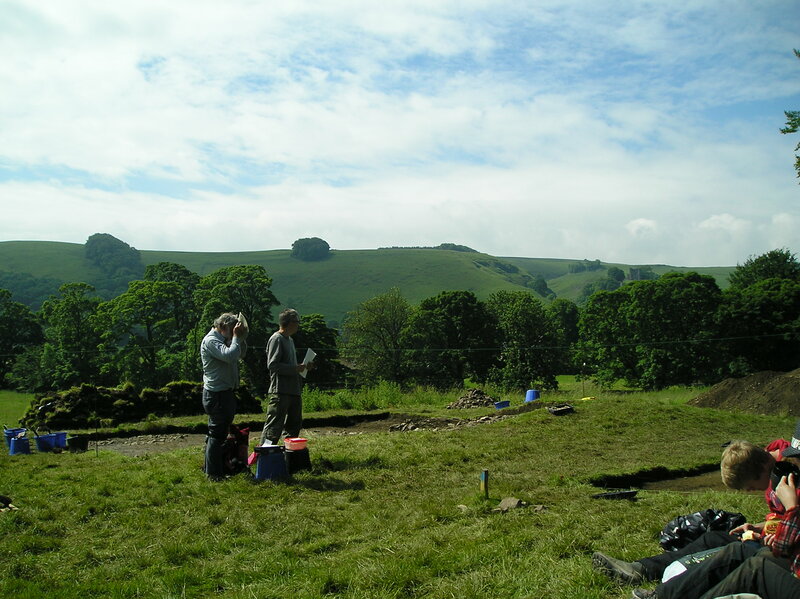 The University of Sheffield archaeological dig at Castleton in the English Peak District. One particular highlight was the digging of a test pit in someone’s back yard under a gazebo with a dear friend, as the rain lashed down and the thunder rolled and roared overhead. Minutes after the downpour the bright rays of the sun penetrated through the dark clouds and the backdrop of the 12th century medieval castle high up on the hill became clear for all to see, it was an immense sight for sore and tired eyes! The excavation provided immense relief from sitting at a keyboard and it reminded me why I love field archaeology, and archaeology in general, so much. Across my travels online I have had the pleasure of reading the adventures of various archaeologists recording their views of the sites they have dug at. A particular favourite can be found at The Facts of My Ignorance site, a delightful read of Callum Dougan’s traipse across Mediterranean and Levantine archaeological sites, volunteering in various countries and at various digs as he goes. His entry on the City of David project is enlightening, and revealing. I have heard of this site before through friends who are studying for the MA in Biblical Archaeology here at Sheffield, and it seems archaeology will forever be tied in with politics, particularly in light about out who funds archaeology and why. Over at Amateur Archaeologist, an impressive self leaner has collated a vast range of online archaeological and linguistics archive as well as writing detailed articles on a vast range of interests from Egyptian archaeology to Mesoamerican linguistics, cultural heritage management to archaeological ethics amongst other topics. I haven’t mentioned it yet on this blog, but Dr Fitzharris’s The Chirurgeons Apprentice is a site to watch out for! It is an amazing repository and archive of detailed research on the ‘early modern chirurgeons’, the forerunners to today’s medical surgeons. This site never disappoints and provides some fascinating insight into what terrors awaited the 17th century person if they ever happened to have an accident or become ill. The subtitle perhaps says it all- ‘A website dedicated to the horrors of pre-anaesthetic surgery’. Up next is Robert M. Chapple’s site who is a professional field archaeologist based in Northern Ireland. On his site are a number of interesting articles on Irish archaeological sites he himself has dug at, alongside various posts on archaeology in the wider world. His entry on his own ‘Transit Van experiment‘ is edifying, and revealing, about the state of theoretical and field archaeology. Meanwhile Hazelnut Relations is a blog ran by the PhD student Marcel Cornelissen at the University of Zurich. It focuses on use wear analysis of microlithic tools across the Mesolithic-Neolithic (Pre) Alpine Central Europe. While his blog does focus on this topic, it also carries a much broader selection, and the author has many years experience in field archaeology in various European countries. Finally we have Wunderkammer, a tumblr blog dedicated to arresting medical/historical images. The byline, ‘a curiosity cabinet of (un)natural wonders’ intrigues, and the site does not disappointment. One perhaps not for the faint of heart. I’ll be back in a while, hopefully with a few different articles on palaeopathology, and the next instalment of the skeletal series. In the meantime au revoir!